QuickCheck science fair water test kits allow the student scientist to perform semiquantitative tests on water samples at home, school or outdoors. These Science Fair test kits include clean, sterile water sample bags and test strip instructions and color concentration comparator that make each kit very convenient and simple to use. Background information on this test # 115 pH and TOTAL ALKALINITY of Water is available as a PDF download. 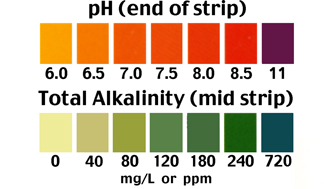 Click here to Order your # 115 – Total Alkalinity and pH Dual test strip test kit based on number of sample tests needed. Contact Us for more information on any of these kits and related kits not shown. www.sciencefairwater.com Water Basics 101 (a web work in progress).